Rollers that are out of spec can make it nearly impossible to properly ink printing forms. Diameter—the spec is 2.5″ on small models (No. 4, SP15) and 3″ on larger models (Universals & SP20) with a tolerance of +/- 0.015″. Measure with calipers. Durometer—the degree of hardness measured by a digital or analog gauge on the Shore A scale. A20: The original Vandercook factory specification for form rollers used primarily with metal types and engravings. A25: A harder spec for polymer plates (Lange). Rollers harden over time. Replace them when they exceed a rating of A30. Rollers with a lower Shore rating can be used for worn or uneven printing surfaces. Roller Materials—all rollers are susceptible to damage, wear, aging, exposure to solvents and ultraviolet light. Buna-N : This is a synthetic rubber unaffected by temperature or humidity. It should not be exposed to direct sunlight. This is the material used by NA Graphics. Urethane : This is an obsolete material that will melt without warning. If the surface appears sweaty, remove from the press immediately! Composition: This is a soft, traditional type of roller made from glue and glycerin. It is favored by some platen press printers, but is not generally recommended for proof presses. It is best cleaned with kerosene. 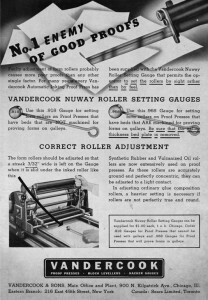 NA Graphics—rollers made from original Vandercook specifications. new spare cores are available. Disassembly—before shipping the cores, consult the operation manual and remove the bearing assemblies and gears (and Woodruff key if applicable). Label and store them in the press cabinet. If choosing NA Graphics, invest in new roller cores.This way you will have rollers on press while waiting on the new ones to arrive.